^^ändTepärät^B |5| After centrifugation, protein from cells by centrifuging. infected bacteria form a pellet containing 32P in the bottom of the tube. Protein E. coli protein from cells by centrifuging. 10.5 Hershey and Chase demonstrated that DNA carries the genetic information in bacteriophages. cells. Eventually, the cells burst and new phage particles emerged. When phages labeled with 35S infected the bacteria, most of the radioactivity separated with the protein ghosts and little remained in the cells. Furthermore, when new phages emerged from the cell, they contained almost no radioactivity (see Figure 10.5). This result indicated that, although the protein component of a phage was necessary for infection, it didn't enter the cell and was not transmitted to progeny phages. Using radioactive isotopes, Hershey and Chase traced the movement of DNA and protein during phage infection. They demonstrated that DNA, not protein, enters the bacterial cell during phage reproduction and that only DNA is passed on to progeny phages. www.whfreeman.com/pierce A discussion of the requirements of the genetic material and the history of our understanding of DNA structure and function. ^ .which are diffracted (bounce off). 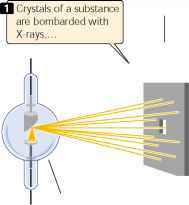 ^ The spacing of the atoms within the crystal determines the diffraction pattern, which appears as spots on a photographic film. ^ Interpretation of the diffraction pattern produced by DNA provides information about the structure of the molecule. The experiments on the nature of the genetic material set the stage for one of the most important advances in the history of biology — the discovery of the three-dimensional structure of DNA by James Watson and Francis Crick in 1953. Watson had studied bacteriophage for his Ph.D.; he was familiar with Avery's work and thus understood the tremendous importance of DNA to genetics. Shortly after receiving his Ph.D., Watson went to the Cavendish Laboratory at Cambridge University in England, where a number of researchers were studying the three-dimensional structure of large molecules. Among these researchers was Francis Crick, who was still working on his Ph.D. Watson and Crick immediately became friends and colleagues. Much of the basic chemistry of DNA had already been determined by Miescher, Kossel, Levene, Chargaff, and others, who had established that DNA consisted of nucleotides, and that each nucleotide contained a sugar, base, and phosphate group. However, how the nucleotides fit together in the three-dimensional structure of the molecule was not at all clear. In 1947, William Ashbury began studying the three-dimensional structure of DNA by using a technique called X-ray diffraction ( FIGURE 10.6), but his diffraction pictures did not provide enough resolution to reveal the structure. A research group at King's College in London, led by Maurice Wilkins and Rosalind Franklin, also was studying the structure of DNA by using X-ray diffraction and obtained strikingly better pictures of the molecule. Wilkins and Franklin, however, were unable to develop a complete structure of the molecule; their progress was impeded by personal discord that existed between them. Watson and Crick investigated the structure of DNA, not by collecting new data but by using all available information about the chemistry of DNA to construct molecular models ( FIGURE 10.7). By applying the laws of structural chemistry, they were able to limit the number of possible structures that DNA could assume. Watson and Crick tested various structures by building models made of wire and metal plates. With their models, they were able to see whether a structure was compatible with chemical principles and with the X-ray images. 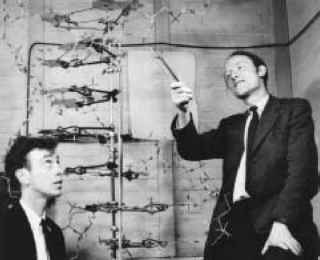 10.7 Watson and Crick provided a three-dimensional model of the structure of DNA. 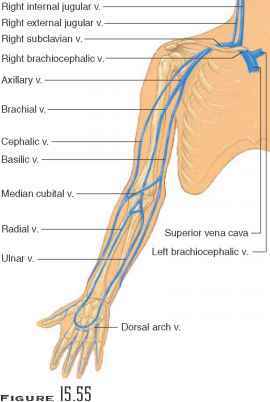 handed helix, with the sugars and phosphates on the outside and the bases in the interior. They published an electrifying description of their model in Nature in 1953. At the same time, Wilkins and Franklin published their X-ray diffraction data, which demonstrated experimentally the theory that DNA was helical in structure.